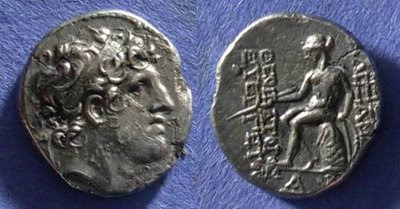 O: Diademed hd of Alexander I r., clean shaven or with sideburn, diadem ends falling straight behind, dotted border. R: ΒΑΣΙΛΕΩΣ ΑΛΕΞΑΝΔΡΟΥ in two lines on r., ΘΕΟΠATOPOΣ EYEPΓETOY in two lines on l., Apollo std l., on omphalos, testing arrow and resting hand on grounded bow. Controls in ex., primary on left. EX: CNG EA 213 (01 July 2009), portion of lot 581, CNG noted that all coins had find patinas. All were average VF. (though this piece has some nicks and scratches and a small flan crack at 10 o'clock on the O).